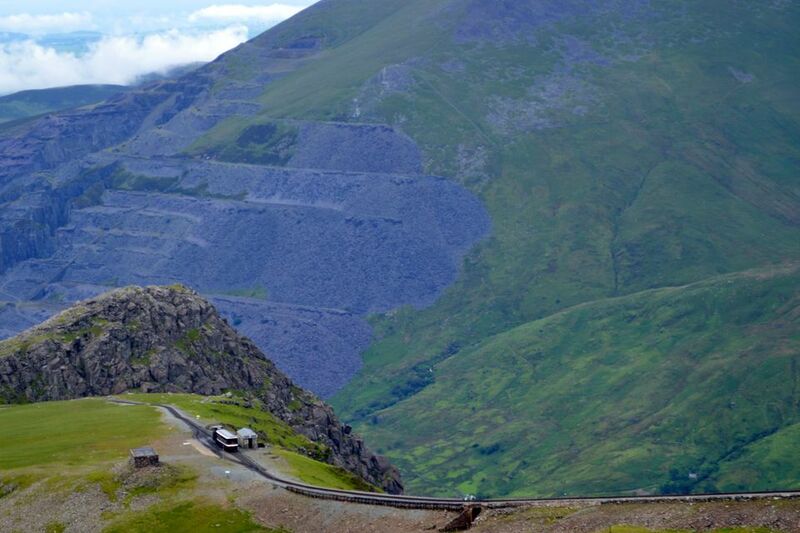 across lake filled valleys to the raw, black slate works of the abandoned Llanberis mines. down nearly vertical slopes to the Pen-y-Pass, also known as the Llanberis Pass. west to the coast and, on a clear day, you might see Ireland. And on the mountain itself, about 700 feet from the base depending upon the route you take, Britain's number one climbing cliff, the Clogwyn Du'r Arddu syncline, thrusts its stony black face through Snowdon's mossy lower slopes. Besides being popular with rock climbers, the syncline is a remarkable natural feature in its own right. It was formed over millennia as earth movement pushed horizontal layers of sediment into vertical layers of rock. The youngest layers of rock are actually in the middle of this stony scar. There are eight official paths to the summit and if you decide to walk,you'll have to balance distance with difficulty. But if nine-mile mountain walks don't seem all that much fun (and I'm with you there), the easiest way to enjoy the views at the summit and along the way is to take a round-trip on the Snowdon Mountain Railway. The railway has been carrying passengers to the Snowdon summit since 1896 using a narrow gauge, rack and pinion mechanism modeled on a successful 19th century system developed in the Swiss Alps. Each train is made up of a single carriage pushed, not pulled, by its locomotive. New (2013) carriages, pushed by diesel locomotives, carry passengers in 10-seat compartments and operate from March to the beginning of November. The journey takes an hour each way and there is a half hour stop at the visitor center near the summit. Until May, the trip only goes as far as the Clogwyn station, at about the halfway point. For a bit more space and a heritage steam experience, you can book the journey on the Snowdon Lily, a Victorian-style carriage built on the chassis and bogey of the original 1896 carriage. This carriage is pushed by one of three of the original 1896 steam locomotives still in service. The Snowdon Lily only runs from May to September. Travelers Tip: When you book your ticket, you'll be assigned to a compartment but not a seat. Compartments are arranged in two benches of five seats each, facing each other. Queue up early because you'll want to try to get one of the four window seats for the best views. Don't linger too long over coffee at the top because you'll once again want to dash for a good seat coming down. The views are radically different from each side of the carriage, especially once the train reaches the mountain's central ridge, so try to grab a seat on the opposite side for the return trip. Telephone: +44(0)844 493 8120 from 1pm daily for booking, availability and weather information. When: Mid March to early November. Early and late season trains only run to just beyond the halfway station. Trains to the summit run from May through September, weather permitting. Tickets: Advance tickets can be booked online or by telephone up to one day ahead of the journey. Tickets can also be purchased at the station ticket office on the day, but at the height of the season, and in good weather, are often sold out by mid morning. Adult, child and disabled prices are available and the Snowdon Lily costs a bit more than the traditional diesel trains. Visit their website for up-to-date times and prices. Facilities: Restrooms, a gift shop and a cafe for light meals and snacks are available at the base station. Drinks, snacks, meals and some souvenirs are also available at the summit station. The station is about about 50 feet below the actual summit which can be reached by a curving flight of open steps. There are eight recognized routes to the summit of Snowdon. The Llanberis Path, at 9 miles, is the longest and because it is considered the easiest it is sometimes called the Tourist Path. Don't be fooled. While some walking clubs and tour organizers term it moderate, the official Snowdonia National Park authority grades it a Hard Mountain Walk. It climbs gently but inexorably for at least three miles and parallels the route of the mountain railway. Nearer to the top, however, it has several very steep sections and a few that are narrow enough to be disturbing if you don't have a head for heights. Add to that the fact that the top of Snowdon is often in the clouds, with wet mist clinging to sections of rocky steps and you have a walk that needs to be taken seriously and with caution. In all seasons, walkers should be prepared for sudden changes in the weather and should pay attention to weather warnings before setting off. The path starts at the end of Victoria Terrace, off the A4086 in Llanberis. It rises 3,199 feet over 4.5 miles (the total distance, there and back is 9 miles). The estimated time for a fit and experienced walker is six hours there and back. If you are thinking of doing this path, it is covered in the OS Explorer OL17(Snowdon & Conwy Valley) map (available to buy through the Snowdonia website).